Our NEW white paper describes solid state transformers; their architecture, operation, advantages and more. 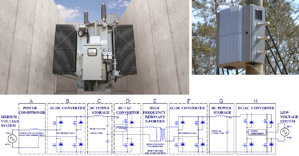 The Solid State Transformer (SST) may be a groundbreaking innovation in electric distribution, replacing the century-old “pole pig” with a modern, active power supply architecture. Although still in the early stages, the SST could be a key component in the “digital grid”, solving problems presented by widespread distributed generation, nonlinear loads, and sensitive electronic equipment.